By Derek Drymon, Jacob Chabot, James Kochalka, Maris Wicks, Kevin Cannon, and Nick Jennings. In the remote wastes of the northern waters, something monstrous sits encased in ice, waiting to be thawed out…by two of silliest nincompoops in the seven seas. SpongeBob and Patrick track a wayward Mr. Krabs to the frozen ruins of an ancient civilization and must deal with the enraged creature that once ruled it! In the tradition of H.P. 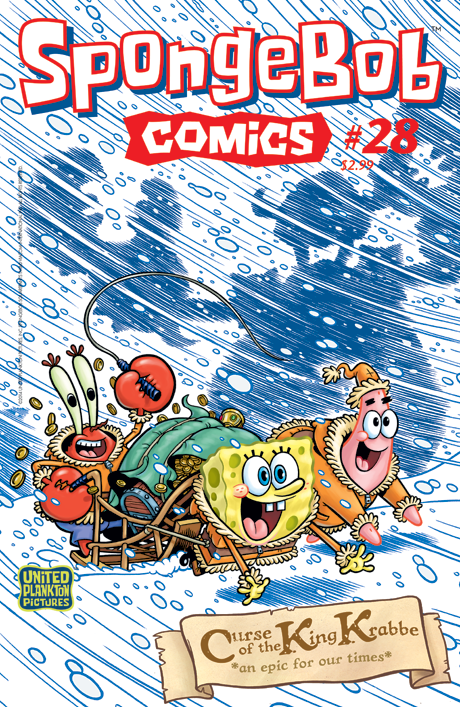 Lovecraft, Carl Barks, Roy Crane, and Snow Dogs comes a full-length SpongeBob arctic adventure, "The Curse of King Krabbe!" Also: Squidward's new career, comics-loving pirates stuck in pack-ice, frigid facts about arctic ocean-life, and more!